Diana “Dinny” Dozier of Edgartown leads a double life. Many Islanders know her as one of the founders of the Animal Shelter of Martha’s Vineyard, where nine years after its opening they can still find her volunteering most days of the week. They may have run into her at one of the Island’s duplicate bridge clubs; she’s played at the national level and hopes to become a grand master. Or they know her as a sailor in the Edgartown Yacht Club’s Herreshoff Fleet who has won the season trophy numerous times and who plans to celebrate her eightieth birthday by competing in the nationals to be held at the club on August 17–19. She is, in other words, one of the multifaceted and civic-minded citizens who thrive on the Vineyard. 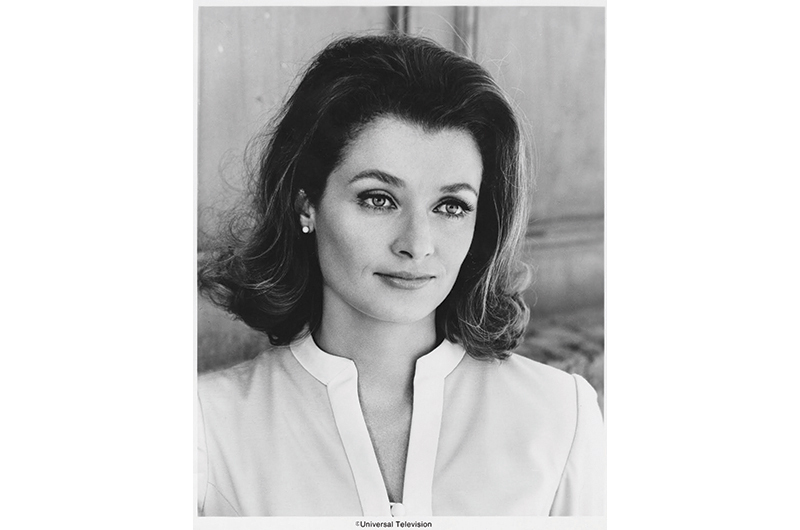 She is also Diana Muldaur, the name she was given at birth and later made famous as an actor who has appeared on Broadway and in a host of Hollywood productions. She acted in films with co-stars like Burt Lancaster, Charlton Heston, and John Wayne, and her roster of TV series reads like an encyclopedia of classic twentieth-century television. She is perhaps best known for her appearances on Star Trek, where she had a guest starring role in the original series and a regular role on Star Trek: The Next Generation as Dr. Katherine Pulaski. Other regular appearances included Born Free, McCloud, A Year in the Life, The Survivors, Fitz and Bones, and The Tony Randall Show. And then there is the list of occasional appearances: Gunsmoke, Bonanza, I Spy, The Courtship of Eddie’s Father, Mod Squad, Hawaii Five-O, Kung Fu, The Rockford Files, Fantasy Island, The Streets of San Francisco (in which Arnold Schwarzenegger’s first onscreen kiss was with her), and Murder, She Wrote. In her last major series, L.A. Law, she earned two Emmy nominations. 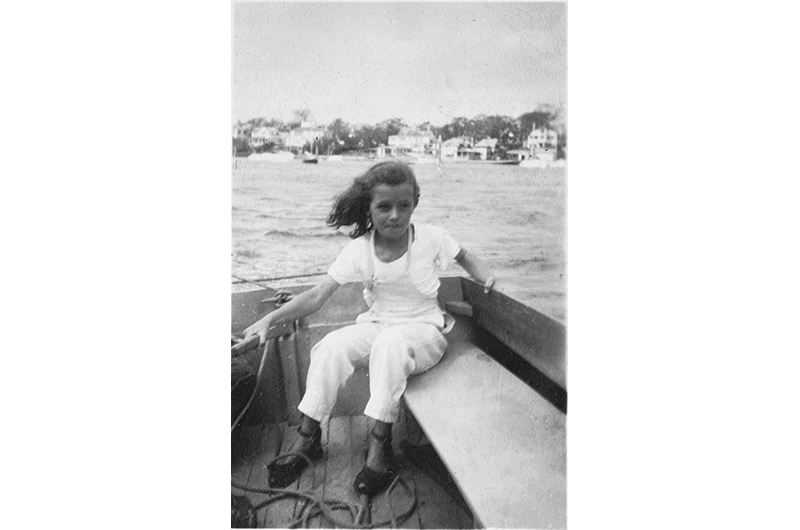 Diana Muldaur sailing a catboat in Edgartown Harbor, 1946. By her own estimation, she may have appeared on more TV series – at least in one-off appearances – than any other actor. But her career is notable not only for the number of characters she played, but also the types of roles she inhabited. “Most of my career I have played interesting women – particularly in my day, which was a long time ago – interesting roles that were women doing something other than just motherhood,” Muldaur says. Those roles may have led to her election to the Screen Actors Guild board, where she headed the committee on Women and Minorities in the Industry for two years in the late seventies. In the eighties she was the first woman to be elected national president of the Academy of Television Arts and Sciences, where during her three-year tenure she helped unify the academy by bringing together the New York, Hollywood, and national branches. “It was a huge shock for the good old boys in Hollywood,” she says. Celebrity isn’t her cup of tea, in other words – and besides, she has too many other interests, not to mention her many friends and family on the Island, where she spent her childhood summers in the Edgartown home in which she has lived year-round since 1998. 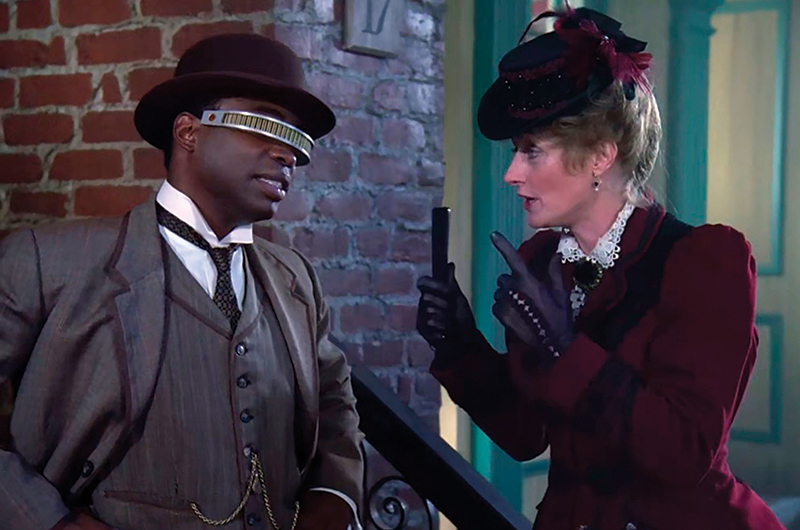 Diana Muldaur on Star Trek: The Next Generation with LeVar Burton. “So much of my family is on the Island,” she says, and shows off an iPhone photo of her seven-year-old great-nephew, Corrick Slavin, weighing in at the 2017 Martha’s Vineyard Striped Bass and Bluefish Derby. Though she has no children of her own, she makes up for it with nieces, nephews, and stepchildren – some, like niece Dardanella Slavin, a chiropractor in Vineyard Haven, who live on the Island year-round, others who spend summers here or visit frequently. The Island has also given her many of her present-day interests, from sailing, which she learned as a young girl, to her love of animals, which has been a recurrent theme in her life. On her twelfth birthday she and her dog Flint won Best in Show at the Agricultural Fair in West Tisbury, she remembers. “So I was always addicted.” She has shown and judged dogs pretty much ever since: this past February an Airedale Terrier she co-owns won best of breed at the famous Westminster Kennel Club Cup in New York. The dog’s name: Reydaleterrydale Star Trek. His call name? “Pulaski,” as in Muldaur’s character in Star Trek: The Next Generation. 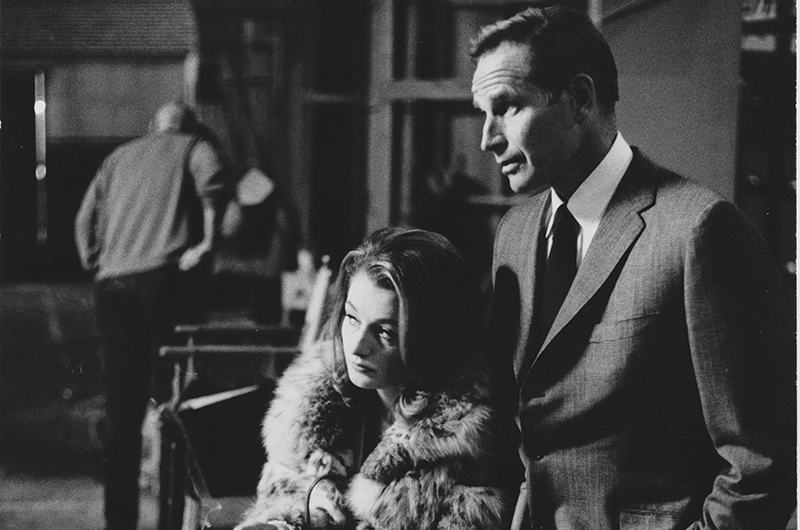 Muldaur on the set of Number One with Charlton Heston, 1969. “I played the mistress,” she says. The shelter, which is entirely staffed by volunteers, takes in and offers for adoption rabbits, hamsters, guinea pigs, cats, and dogs who have been abandoned or abused and are needy. The shelter also coordinates with the Island’s animal control officers as well as the Island’s Disaster Animal Response Team. It has found homes for upwards of 1,000 Island animals in its nine years of operation. “I’d love to get the big stars on the Island involved,” she says with no apparent hint of irony. “I have no idea,” Muldaur confesses when asked why she became an actor. As a child, she struggled with severe asthma, saying it was a miracle she survived. As a result she became an inveterate reader. In high school she played “a lot of old ladies” at St. Margaret School in Waterbury, Connecticut, and in her junior year Elizabeth Barrett Browning in The Barretts of Wimpole Street. She served as president of the drama club at Sweet Briar College in Virginia, from which she graduated in 1960, but only changed her major from art history to drama at the last minute. During those years she plunged into acting seriously, doing summer stock at the Cape Playhouse and on-Island with the Charles Street Players in the old Edgartown town hall. She did Shakespeare and the classics with Olympia Dukakis and Linda Lavin at Wellesley College, where she played an ostrich in Peter Pan. “I did whatever I could as an apprentice,” she says. The Muldaurs at the Chappaquiddick Bathing Beach, circa 1947. 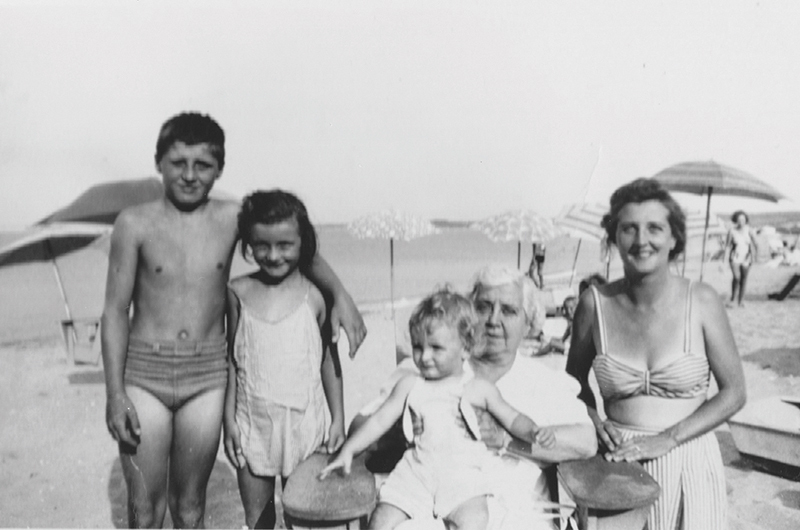 From left: Charlie, Diana, Geoff, grandmother Susan Jones, and mother Patsy. Her first off-Broadway performance was in Jean Genet’s The Balcony. Then came Luigi Pirandello’s Six Characters in Search of an Author, followed by Seidman and Son on Broadway. “It was easier to act on Broadway,” she says; she did a play there every year for three years. “I would sneak up to Martha’s Vineyard alone, sometimes for only one night, and build a fire,” she recalls. Hollywood followed soon after. She landed a small part in the Burt Lancaster vehicle The Swimmer, shot in Connecticut. “I was an easy sell,” she says. “They saw talent and thought I was very beautiful. I really never stopped working.” Even though it was not thought highly of at the time, between films Muldaur appeared on the little screen. “I thought television was one of the most marvelous things,” she says. Her break came when she appeared in the original Star Trek as Dr. Ann Mulhall and also Dr. Miranda James. “Gene Roddenberry discovered me in many ways, when I was a kid in Hollywood,” she says of the creator of the show and the roles that are still remembered more than a half-century later. Not that her later work is forgotten. Her last major acting coup was her role as Rosalind Shays on L.A. Law, the Steven Bochco series for which she received two more Emmy nominations. The scene where she appears in bed with her enemy Leland McKenzie shocked the country, and is still remembered as a banner controversial moment in television history. “I don’t think they quite understood how she was going to stir up things in America,” Muldaur says of her character. “If it were a man doing the same thing, no one would blink.” The character’s stunning exit from the show came when she fell down an elevator shaft. A Universal Television promotional headshot. She’s also developing a new film project with her old friends the film director Sidney Furie, who is eighty-five, and actor Barry Newman, who is seventy-nine. For now, though, that project is on hold because Furie wants to rewrite his script. What a fascinating strong woman and life story. There aren't enough adjectives to describe her. I met her close to 40 years ago in NYC at an art gallery opening. She was so interesting to speak to and an amazing beauty. Her knowledge and appreciation of art was incredible. I can only imagine how awesome the Sweet Briar theater productions must have been with her involvement. When were you last at Sweet Briar? It would be so marvelous if you could come back soon! These 3,250 acres are spectacular as always, and the energy of the students, faculty, administration and staff is inspiring and invigorating! Agreed. Holla, holla, Dinny! Nothing that you cannot do! I was lucky enough to get to spend some time with her when she came to Sweet Briar to accept the Distinguished Alumnae Award. Holla Holla from ‘91! I’ve been enamored with Diana’s acting for ages — her talent lights up the screen. So happy to read about her on-going success in other endevours. As a young newcomer to Hollywood working on my first TV series, I met Diana filming one of the episodes of Kingston Confidential with Raymond Burr...She was so kind to me and a joy to act with...a Class act...I'd lost touch with her over the years and have since moved back to my native country of Canada...I do have friends in MV ...Larry Mollin who has written a number of plays staged there...if you see " Dinny " please give her my very best ! also my email if you wish...arthindle @yahoo.ca ...and who knows, one of these days when I'm visiting Larry, Dinny & I could indulge in a pastime from our youth...sailing !